There also appeared to be a draining abscess to the outside of the white line. Frazzle was generally very sensitive to hoof testers over the entire surface of the sole and over this hole. I also noticed that the abscess had burst out of the coronet band adjacent to this hole on the white line. I diagnosed him with white line disease (or seedy toe). Sadly, Frazzle has had a few episodes of foot lameness over the past year or so. Being a geriatric donkey, this is very common as donkeys often suffer with chronic foot disease and seedy toe. What is chronic foot disease in donkeys? Chronic foot disease is the most common veterinary condition seen in the geriatric (over 20 years old) donkey. Sometimes poor pasture management, poor hoof management and obesity can predispose a donkey to having foot problems as the animal ages. What is white line disease or 'seedy toe'? Seedy toe initially affects the horn layer adjacent to the white line. The horn in this area tends to be grey and crumbly and you can see pockets of pus along the white line or extensive separation of the wall from the white line in more severe cases. Seedy toe will rarely cause acute lameness, but animals can present suddenly if they develop an abscess as a result of the seedy toe. This is what's thought to be the cause of lameness for Frazzle. Frazzle wasn't the most compliant of donkeys and I had to sedate him to examine his foot. I removed the diseased white line with a hoof knife and followed the abscess tract up the side of the hoof wall. It's important to avoid the sensitive structures of the foot when doing this. 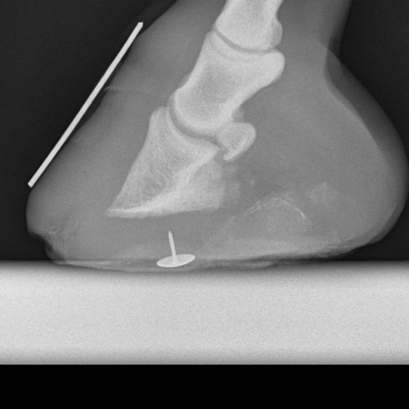 Frazzle also underwent X-rays of both his front feet to assess foot balance and depth of sole, as well as highlight any further lurking abscess or separation of the white line. He was also given oral antibiotics and pain relief, helping him to be more comfortable. On X-rays his feet didn’t appear too bad, there was some seedy toe noted, worse on the right than the left and his toes were slightly long. Frazzle made a full recovery with medication and poulticing and had his feet trimmed. Frazzle will need regular hoof trimming (every 10 weeks) and pasture management to keep him comfortable, paying particular attention when pastures are wet.